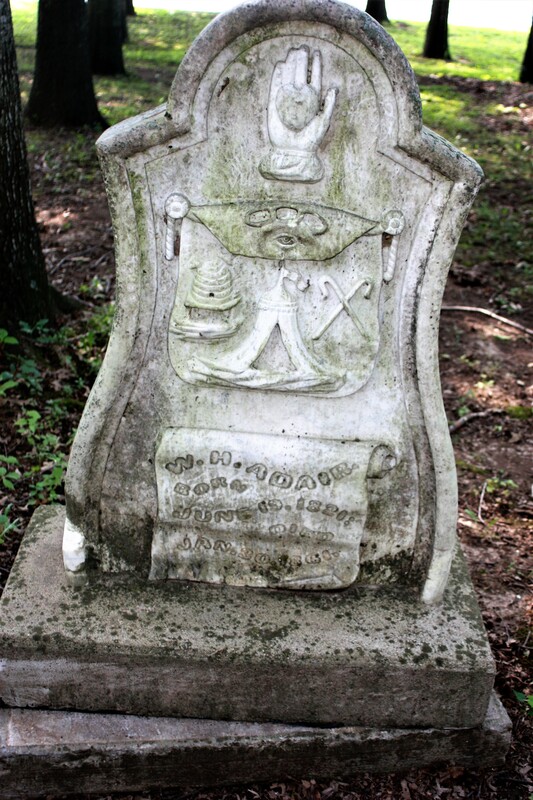 The Old Cynthiana Cemetery, located in the small town of that name, holds many treasures. Ritchey and I visited there in August of 2013. From FaceBook I learn that there has been a concerted community effort to clean up the cemetery. From girl scout troops to individuals and everyone in between, much hard work and effort has been put forth to preserve this wonderful part of Harrison County’s heritage. They even had a picnic in the cemetery August 26th of last year – I thought Ritchey and I were the only ones who thought that was fun! 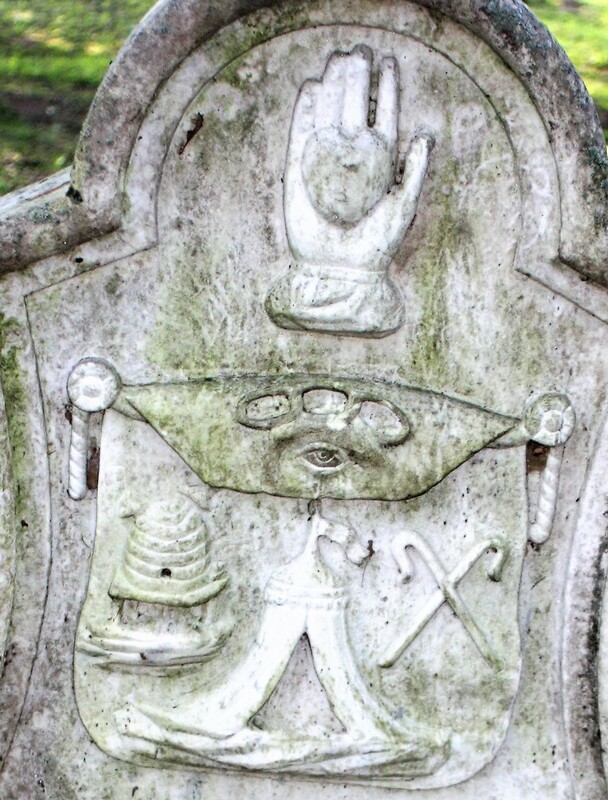 Gravestones have been cleaned – I can’t wait to visit again! But today I want to share one particular stone, that of Dr. William H. Adair. Dr. Adair is somewhat of a mystery. He was born June 19, 1821, in Kentucky. November 23, 1847, William married America Snodgrass. William was of age and consent for America was given by her father, James Snodgrass. I could not find the couple in the 1850 census, but in 1860 census they were living in Cynthiana. William was 37, a physician, and America, 32. With them lived Henry McDowell, 25, also a physician; and J. H. Pohl, 23, a druggist. Three Irishmen also lived in the household – all laborers – Edmund Reddy, 24; John Reddy, 22; and James Crow, 25. In seven months, William Adair was dead. I found no information about children, however if they lived short lives between the census we may never know if they existed. I could find nothing more on his widow, America. Since she was still a young woman she probably married again. 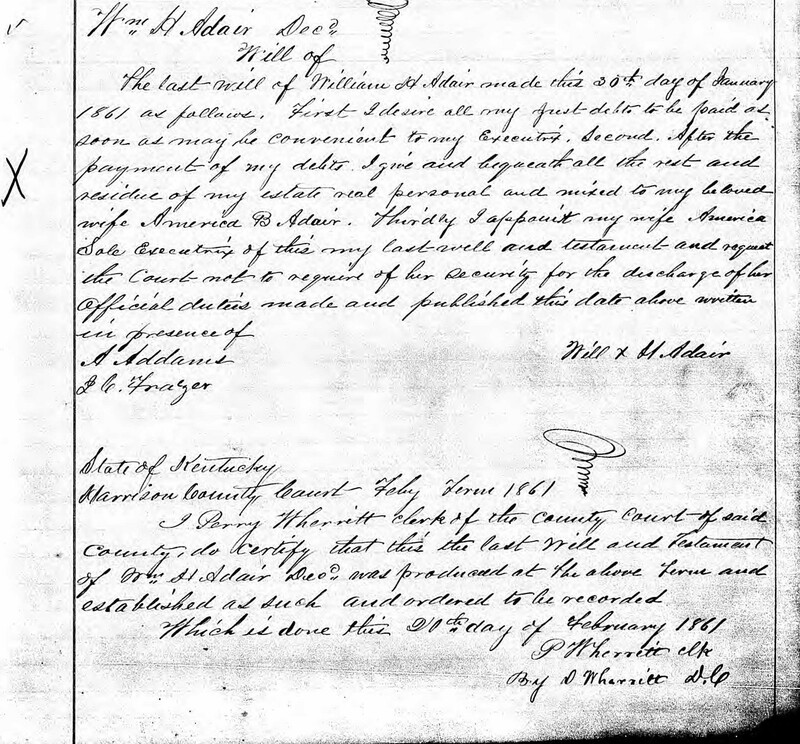 William’s will was written on the day he died, January 30, 1861. There is an ‘X’ for his signature. I’m sure, as a doctor, he could read and write. Perhaps he was so ill all he could do is make his last wishes known and place his X. 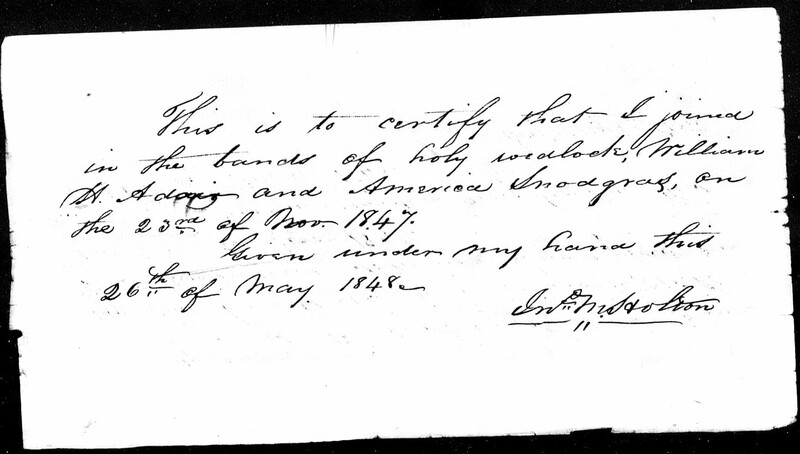 The last will of William H. Adair made this 30th day of January 1861 as follows. First, I desire all my just debts to be paid as soon as may be convenient to my executrix. Second, after the payment of my debts I give and bequeath all the rest and residue of my estate, real, personal and mixed, to my beloved wife, America B. Adair. Thirdly I appoint my wife America sole executrix of this my last will and testament and request the Court not to require of her security for the discharge of her official duties. Made and published this date above written in presence of A. Addams, J. C. Frazer. I, Perry Wherritt, Clerk of the County Court of said county, do certify that this, the last will and testament of William H. Adair, deceased, was produced at the above term and established as such and ordered to be recorded. Which is done this 20th day of February 1861. America Adair procured a beautiful gravestone in memory of her husband. It is filled with symbolism and iconography. The top of the stone shows a tent, representing the Tabernacle built by Moses. This is a symbol used by Masonic societies through the ages. The all-seeing eye in the center is the ancient symbol for God, again, used by the Masons. The three chain links stand for friendship, love and truth, and sometimes have the letters F, L and T inside – although it is difficult to tell from the photo is those letters are indeed inside the links. The hand with heart denotes charity and is a Masonic symbol. W. H. Adair, born June 19, 1821, died January 30, 1861. Old Cynthiana Cemetery, Harrison County, Kentucky.